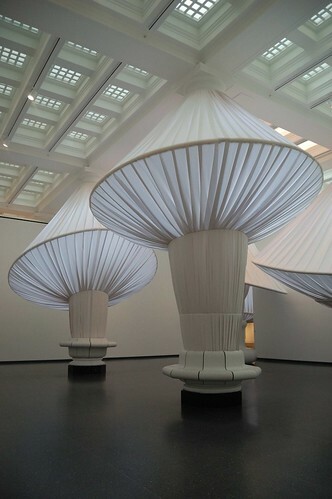 On Friday, during a day trip to Brooklyn, Laura and I were greeted by some giant, white fabric mushrooms in the Great Hall of the Brooklyn Museum. The installation by Situ Studio, a Brooklyn-based creative practice specializing in design and fabrication, is intended to serve as a hub for visitors to congregate, relax, and view the occasional performance. reOrder is the first installation in the newly-renovated Great Hall, completed by Ennead Architects. There was also a fascinating and memorable Norman Rockwell: Behind the Camera exhibit that featured the artist’s illustrations from The Saturday Evening Post and described the painstaking process he took to compose each painting, which took a lot more work and meticulousness than one would imagine. Some of my favorites included The Tattoo Artist and The Maternity Waiting Room. Unfortunately, we weren’t allowed to take photos, but this exhibit is definitely one that you have to see in-person. Admission to both exhibits and the rest of the museum is $6. You are currently reading reOrder and Rockwell at Notes on Food.